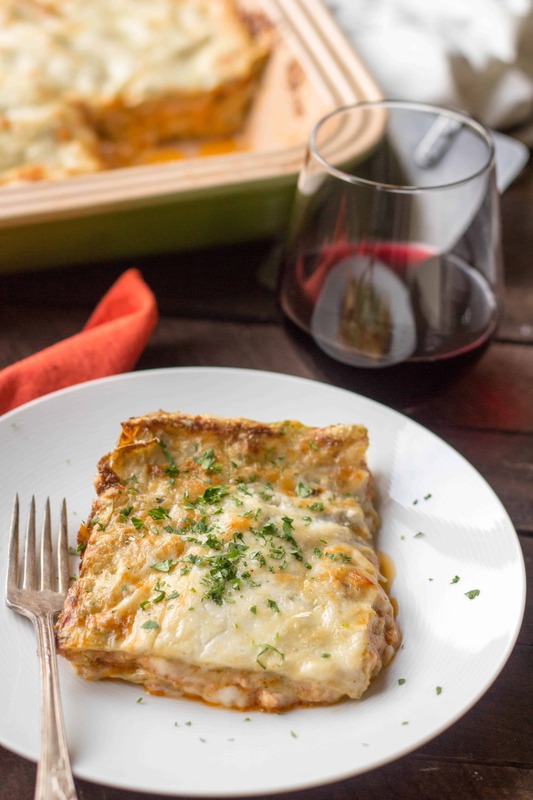 This authentic recipe for Lasagne Bolognese is much different from the traditional American style Lasagna. It’s rich, meaty and incredibly delicious. File this recipe under the “labor of love” category, with extra emphasis on the love. Last September I had the exceptional privilege of experiencing real deal lasagne in its natural habitat, Italy. 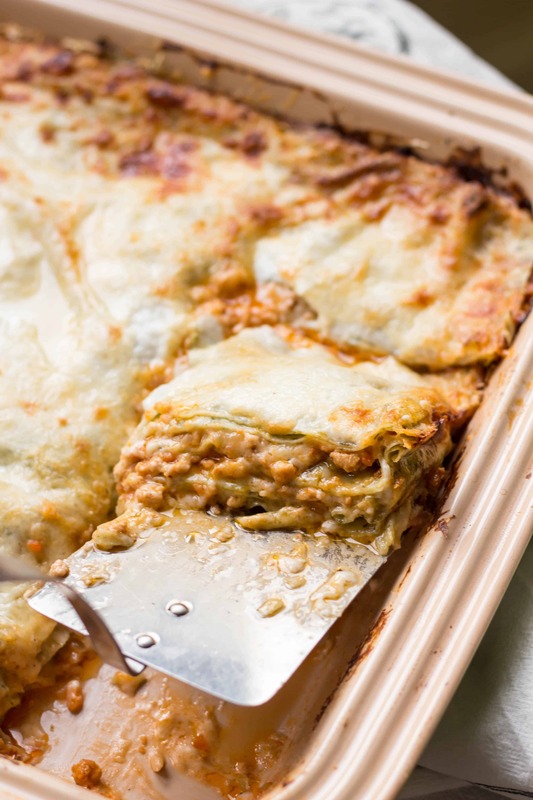 It was in Bologna, to be exact, and it was unlike any lasagne I’ve ever had in my life – which has certainly seen its fair share of lasagnes. 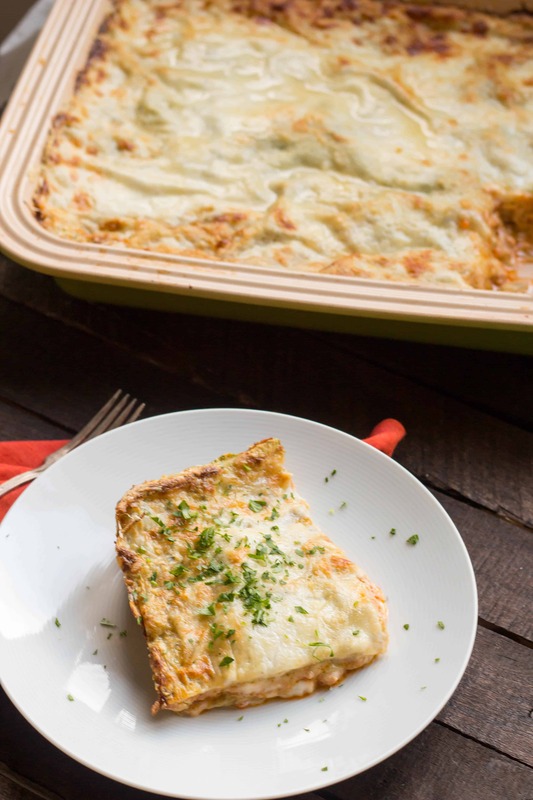 Lasagne Bolognese is similar, but oh, so different from the version most of us are used to. 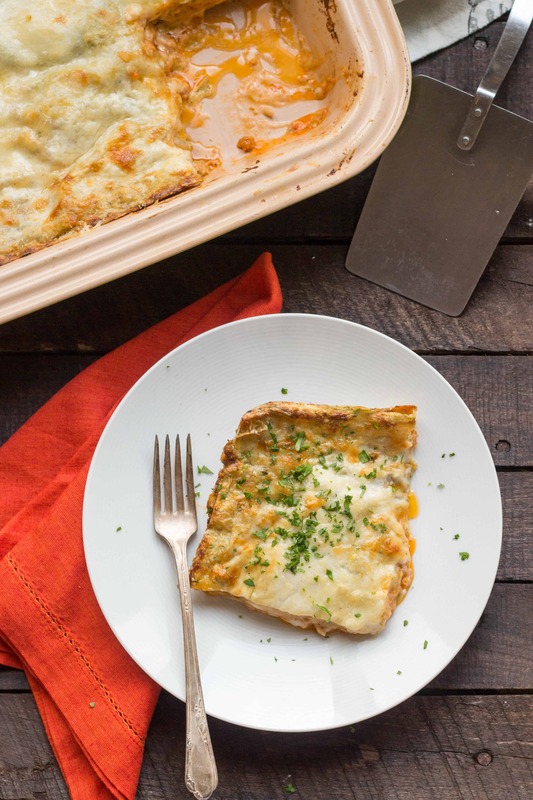 I grew up eating lasagne that consisted of long, flat noodles layered with marinara sauce, a mixture of ricotta, egg, parmesan and parsley, and lots and lots of mozzarella cheese. No meat, but only because my mom preferred it without. I love that lasagne. It’s homey Italian comfort food at its best. But this lasagne is an entirely different animal. First up, there’s the sauce. You won’t find any marinara here. This recipe instead calls for Ragu Bolognese, the traditional meat sauce of the region. It’s rich and meaty, made with a combination of pork, veal and pancetta in addition to mirepoix, garlic, a touch of tomato paste, white wine, and milk. Yes, milk. There are no herbs or fussy spices in the mix, it’s simply high quality ingredients and proper technique that make it so mind-numbingly good. Next up, the cheese. No mozz. No ricotta. Now before you get upset about that, just know that I love ricotta and mozzarella just as much as any other hot blooded Sicilian girl. But I promise you, they just aren’t needed here. Instead, we make a velvety, creamy bechamel sauce, scented lightly with nutmeg, and then use a whole mess of parmesan cheese. The good kind – this is not a place for the cheap stuff. And then, there’s the pasta. When we were in Bologna we ordered lasagna a total of two times, but eyed it up at least ten other times on neighboring tables. What surprised us was that every single time, the noodles, which were always homemade, were green, as in they’d been made with spinach. We found it interesting that it was never mentioned in menu descriptions; that’s just the way it was supposed to be. I don’t think the spinach really adds a whole lot of flavor, if any at all, but it definitely makes you feel a little better knowing there’s something green within all that meaty, cheesy goodness. I couldn’t wait to tackle this lasagne at home, and this weekend I finally got around to doing it. I researched several recipes and landed on one by Mario Batali. What set this recipe apart from all the others I came across was that it called for spinach in the pasta, and I knew instantly that it had to be authentic. I have to say, it’s somewhat of a goofy recipe, especially considering it lives on FoodNetwork.com. It lacks a good bit of detail and has a few rather confusing instructions, like layering everything in a brownie pan (WTF is a brownie pan?). I imagine it’s still far more detailed than anything you’d get from any Nonna worth her weight, so I’m grateful it even exists in the first place. I’ve gone ahead and added in some more detailed instructions and changed things like “brownie pan” to say what they really mean, like “9×13 inch pan.” Because seriously, Mario, what is that even all about? The verdict? It’s good. Really good. And it’s damn close to what we had in Italy. 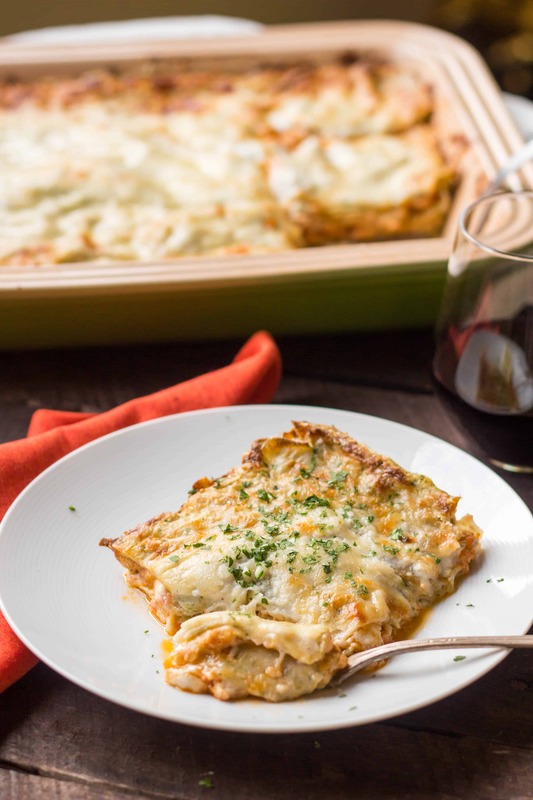 It’s incredibly rich, even more so than the mozzarella heavy lasagne we’re all used to. I recommend having some friends over to help you eat it, because after the 3rd day of leftovers, you can can actually feel the fat hardening in your veins. But my god, it’s so worth it. 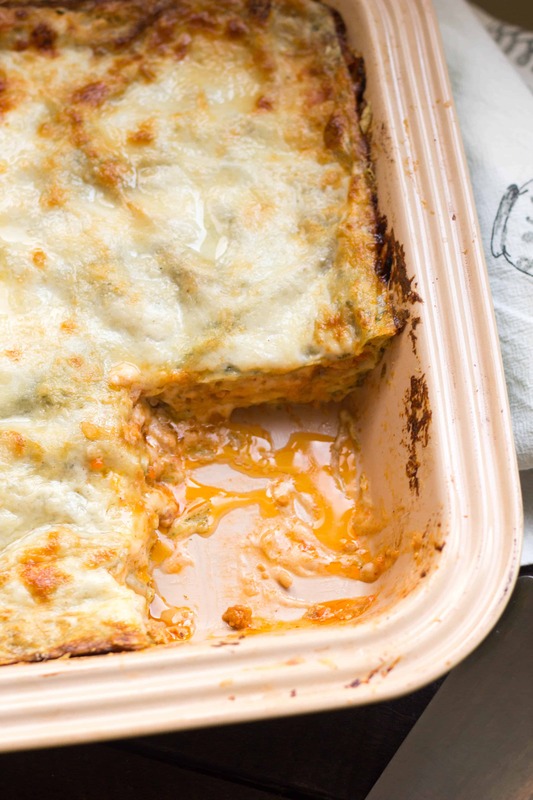 Life is way too short to deny yourself any lasagne, but especially this lasagne. Place the defrosted spinach in a dish towel and squeeze it to remove as much liquid as possible. 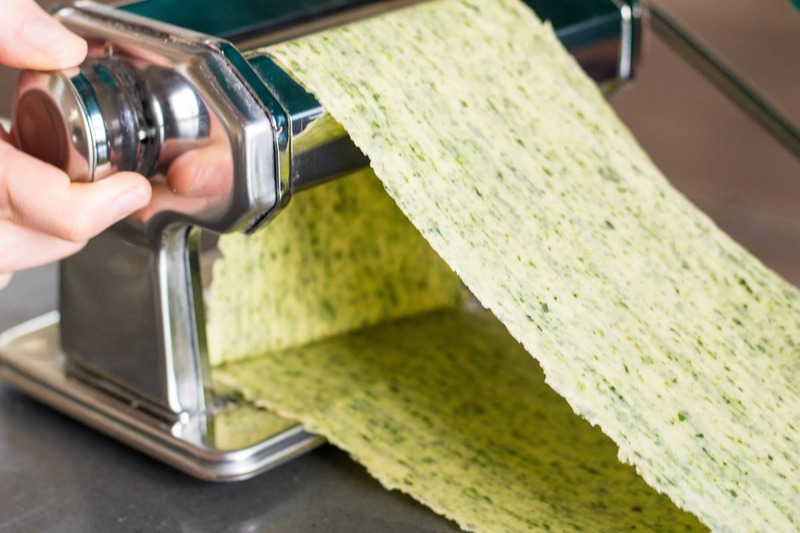 Chop the spinach very finely - you can use a food processor to make this easier. Pour 3 1/2 cups of flour in the center of a large work space, then make a well in the center. Add the eggs, spinach and 1/2 teaspoon of olive oil, then use a fork to start beating together the eggs. Slowly begin incorporating the flour from the inner rim of the well, while being careful to retain the sides of the well so that the egg mixture does not escape. Once most of the flour is incorporated, start kneading the dough until it's elastic and slightly sticky, adding a bit more olive oil if it's too dry, about 6 minutes. Wrap the dough in plastic and allow to rest for 30 minutes at room temperature. Divide the dough into 3 equal portions, then roll each out as thin as possible, using a rolling pin or a pasta rolling machine. Cut the dough into strips. Bring a large pot of water to a rolling boil, and season liberally with salt. Set up an ice bath next to the stove. Working in batches, cook the strips of pasta for one minute, then immediately shock them in the ice bath. Drain well on towels and set aside. Make the Bechamel: Melt the butter in a medium saucepan, then whisk in the flour until smooth. Cook over medium heat until light golden brown, about 5 minutes. Add milk to the roux 1 cup at a time, whisking continuously until very smooth, then bring to a boil. Cook for about 2 to 3 minutes, then remove from heat. Season with nutmeg, salt and pepper to taste, and set aside. Preheat the oven to 375 degrees. Ladle a small amount of ragu in a 9x13 inch baking pan and spread it out to cover, then top with a sprinkling of grated parmesan cheese. Next, add a layer of pasta, then a thin layer of bechamel, a thin layer of ragu, and a sprinkling of grated parmesan. Repeat until all sauce and pasta are used up. The top layer should be pasta with bechamel over it. Top with lots of grated parmesan and bake in the oven for 30 to 45 minutes, until bubbling and browned around the edges. Remove from the oven and allow to cool for at least 10 minutes before slicing. 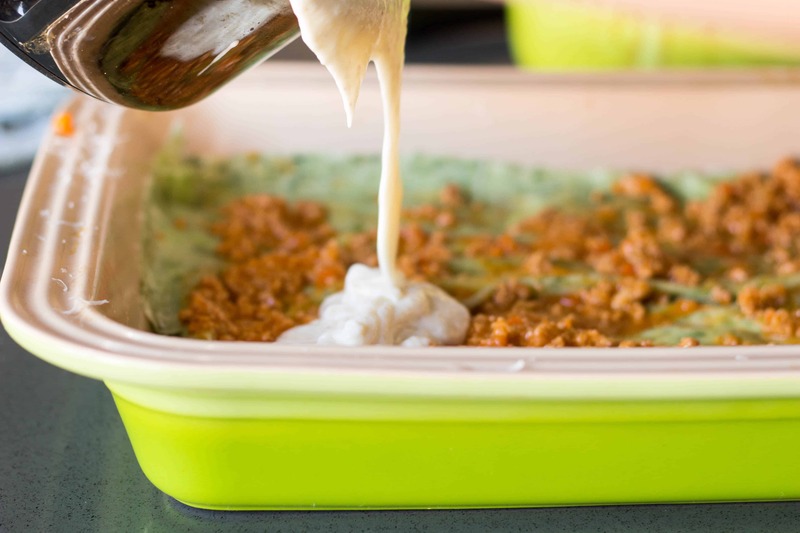 *If making the ragu in advance, be sure to heat it up prior to layering the lasagne. 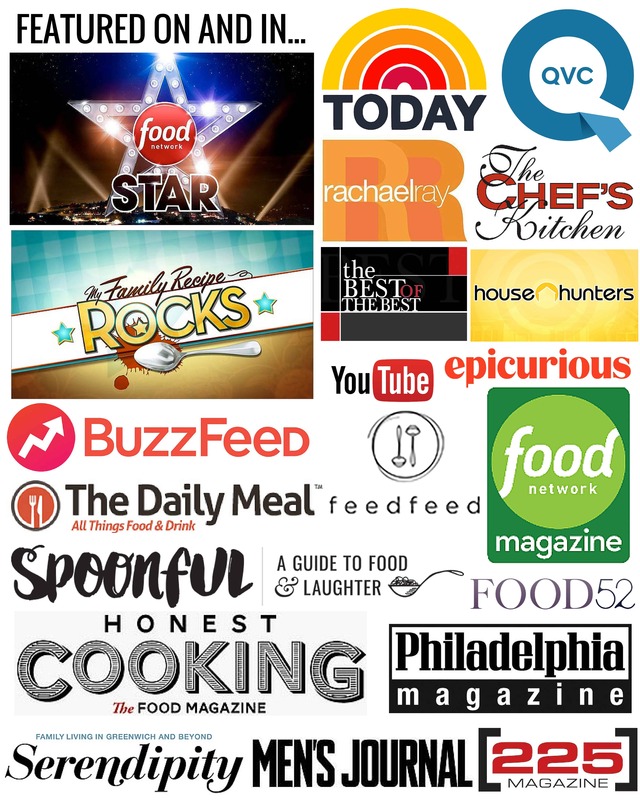 I can’t tell you how many times I’ve been burned by Food Network recipes, especially Alton Brown ones, because they are plain up incorrect versus what’s shown in the episode. (I’m so thankful for the Good Eats Fan Page which has transcripts from every freaking episode to reference when I need it!) If you’re interested, the lasagne is actually in Mario Batali’s Molto Italiano which is a fantastic book as evidenced by the fact that pages of it are falling out after years of use. Thats funny you mention that, because I’ve made a few AB recipes from FN.com and they have not turned out well (the sugar cookies in particular if I remember correctly). But I’ve also made good ones, too. I recommend halving this recipe even if your husband would eat it and it was just the two of you. Chaser and I had this 4 days in a row now, and it’s soooo good, but way to rich to be eating on a regular basis. Thanks, Sabrina! 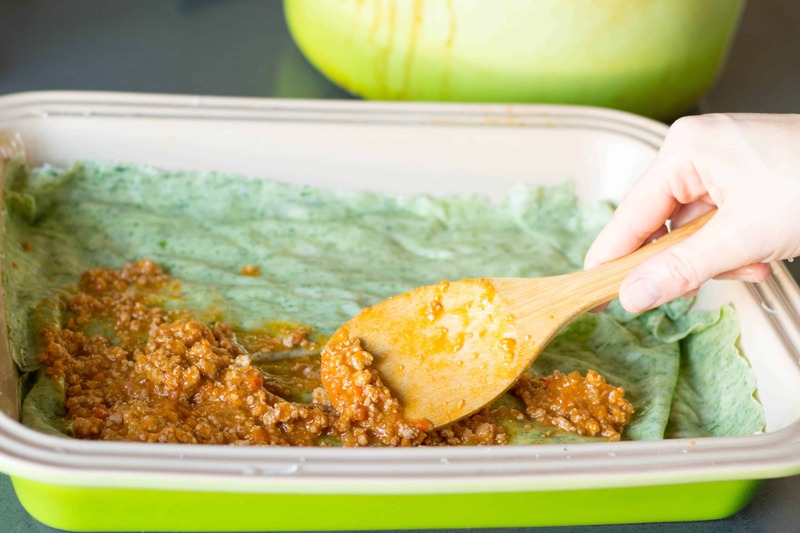 I think you’ll love the spinach pasta – it’s so authentic!